On the news we&apos;ve seen months of images of the harsh weather - ice storms, nights stranded on gridlocked expressways, blizzards, earthquakes, mudslides, floods, forest fires, droughts, a record warm winter in Europe and soggy slopes at the Sochi Olympics. In our region, a polar vortex has dealt us wave after wave of below-zero Fahrenheit temperatures, lakes frozen over, and night after night of fluffy snow since Thanksgiving. What a deal! After the shoveling and roof raking is taken care of, we know how fast that fluffy snow can melt. 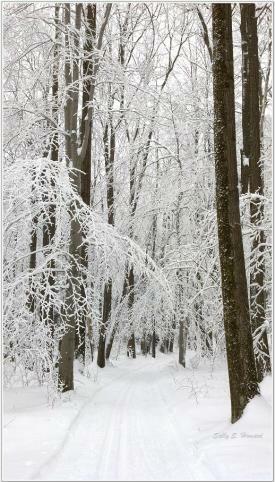 Time to make haste and head out for ice fishing, winter photography, snowshoeing and skiing. You never know until it&apos;s too late if this storm might be the LAST fishable ice or skiable snow! When the Monroe County parks near me don&apos;t have enough snow to enjoy, I head due south on Rt 65 to CR 37 to Canadice Hill Road to one of my favorite places: Harriet Hollister Spencer State Recreation Area in Springwater, NY. Perched more than 2000&apos; above sea level, high on a bluff overlooking Honeoye Lake, this park often has plenty of snow on beautiful cross country skiing trails long after the rest of our region is melted down to grass and mud. I check the snow depth map and the Rochester XC Ski Foundation website, and then drive confidently past the brown grass, corn stubble, and narrow islands of snow drifts, towards those steep hills, softly covered with the bare trees of winter. As the hills rise up, I see the green and brown fields give way to a spreading white blanket of snow cover, some days with each branch like white lace...and my heart quickens. There it is: an oasis of snow. "Our snowasis" as my family calls it. It&apos;s a really good sign when I pull into that little parking lot and see a couple of xc-skiers gliding back to the parking lot with satisfied smiles on their faces. I eagerly check out the trails at the parking lot and assess - Skis or snowshoes today? Or does the fresh snow call for a little of both?! Unlike gym treadmills or amusement rides, our natural parks are filled with wonderful variation and a new experience each time you visit. The snow can be icy and fast, soft and controlled, sticky and slow, or silky and dreamy. The trees may be roaring with hilltop breezes or so still and quiet you can hear the snap of sap freezing and the tap of snowflakes landing on your jacket. 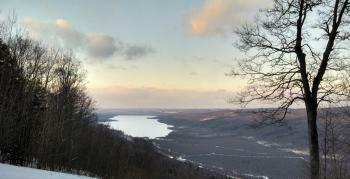 Honeoye Lake may be gleaming in the sunshine, frozen & bright, dotted with shadows from clouds, melted and watery-dark, nearly hidden behind veils of snow, or rosy in the glow of a winter sunset. Will I make a vigorous beeline up the wide Overlook Trail to see what the Honeoye Lake vista looks like today, and if Rochester, 35 miles in the distance, is visible? Am I up to conquering the Sidewinder trail at the top of the hill? Or will I meander through the woods on Big Oak Trail? Gotta pay attention - so I spot the grand tree for which the trail was undoubtedly named. Surrounded by stately trees on beautiful rolling hills and passed by smiling people declaring “Beautiful Day!" - I am filled with joy and gratitude. I can&apos;t help but to hope that maybe Heaven will be a little like this. I think of Harriet Hollister Spencer, a Rochester civic leader, and whisper a thank you to her for gifting this land to us. I smile back at those happy people and appreciate the cooperation going on here. It takes effort by everyone to keep these trails in great shape as they freeze, thaw, get more snow and re-freeze. My thanks to the many volunteers who raked leaves off the trails last November, to the groomer who meticulously rolls and tracks the trails, to the members of Rochester XC Ski Foundation who fund the grooming, and to all the park visitors who walk to the side of the groomed tracks, being careful not to make postholes in the soft snow, and who leash their pets and make sure no doggy doo is left behind! And breathing in that fresh air, I&apos;m especially grateful to the Creator of all I see. In my pack, I have plenty of water, snacks and a headlamp ... so I can stay as long as possible at this lovely park. On those silky snow days, when I finally make myself head back to my car, I love to finish with the new Ruthie&apos;s Run trail. This trail finishes with wonderfully banked, back and forth S-curves, so I focus to execute them as elegantly as I can, and glide downhill and out of the woods, right to the parking lot - complete with a rush of Olympic victory cheers in my imagination! Then as I leave my "snowasis" and travel back to the bare pavement and work to be done, I plot all the way home - How soon can I come back to Harriet? Sally Howard is database designer, technical trainer and owner of Solara Concepts, a Rochester-based consulting business. A self-described environmental steward, Sally loves her time out in nature, especially the beautiful public parks that together we protect and maintain in the Finger Lakes and all across New York State.